You can thank SX255 for this brilliance. Hard to refuse a request like that. This is brilliant. Just absolutely fantastic. Thanks Aegis for drawing it (?) and SX255 for the commission (?) . Lay it to rest and contemplate better things. And say hi to all your old friends while they're all together (hint: give Sacred 1 and/or 2 a replay). Yes, I drew it, and again thank SX255 for the idea. Wouldn't have touched the idea with a fifty foot pole till he revealed his evil plan. The color, the shading, the detail, the overall summarized message and atmosphere. Aegis, can we freely copy-past this work with your permission? In any case, we now have a perfect summary for all or emotions and reviews rolled up into one simple image. This is Brilliant Aegis, well done!! You couldn't have captured of what counts to us, as fans and broken hearted-cryers about what happend, is happening, and we never want to happen again. Credit the source and you can post this anywhere. Anyways, glad you all like the jab. Pure sadness of our beloved franchise, but still all in good fun, too. Oh... Wow... Honestly. At first I smiled, then snickered and then... As I looked longer and longer I think I actually shed a tear, lol. Seriously though. The drawing sums up earily too well. Excellent idea and execution! Shed a tear, huh? Can't say I blame you or anyone for that matter. And thanks. I'm glad you got some joy out of it. Well at first I took it as a mocking jab at deep silver's version of Sacred but after looking a while I could see a fair bit of thought went into choosing the character's, their positions and tone. I especially like the two at the far left. Is that SX255 at the far left, inconsolable by the dwarf? That's why it's so brilliant. Every character is there, and how they look, what they're doing, who they're interacting with/standing by, it's all just right. The TG is understandably on his knees devastated since SX255 had the idea for the drawing. And his S1 counterpart the Dwarf, already being of that height, is consoling him. The Wood Elf and Dark Elf, the couple from S1 take comfort in each other's embrace, while their kin the High Elf stands close with her little pet demon. The Dragon Mage turns away while his little Familiar howls at the sky. The Dryad is in dress attire but still has a leafy hat and a shrunken head. She offers tissues to the Gladiator, who still refuses to don a shirt but at least manages a little bowtie. The two symbols of Light and Shadow stand at center. The Seraphim heads up the service and reads a passage while the Inquisitor stands stoically next to her with head reverently bowed. The Daemon consoles the Battlemage, somewhat sensually I might add. Maybe a "celebration of life" is in order later that night. The Shadow Warrior, the strongest and already dirty with graveyard soil, has the gravedigger's duty. And the Vampiress stands aloof holding her parasol to keep the sun's rays off of her. Is that SX255 at the far left, inconsolable by the dwarf? No, I did not request any self-insertion - it would have ruined the picture. Besides, I'm a battle extension of a guy. No regrets - the picture is perfect. You guys duo'd on this so well. In fact, I find myself returning to this image over and over. It bring a lot of nostalgia to my heart. Great detail, great care in this obviously from devoted and loving fans. Aegis, I just saw you add this to SacredWiki... nice!! I was also asked to have this pic posted at the Sacred portal. Pretty amused yet saddened at the same time. Sacred Portal? Which one Aegis, got a link? The picture is slowly going around all the communities. gogo: Yeah, what he said. I was kinda curious how far the pic went given the reactions on this thread. In a strange way, it's funny how a fans' creativity looks to bring the greatest amount of critique if not shame to the company. 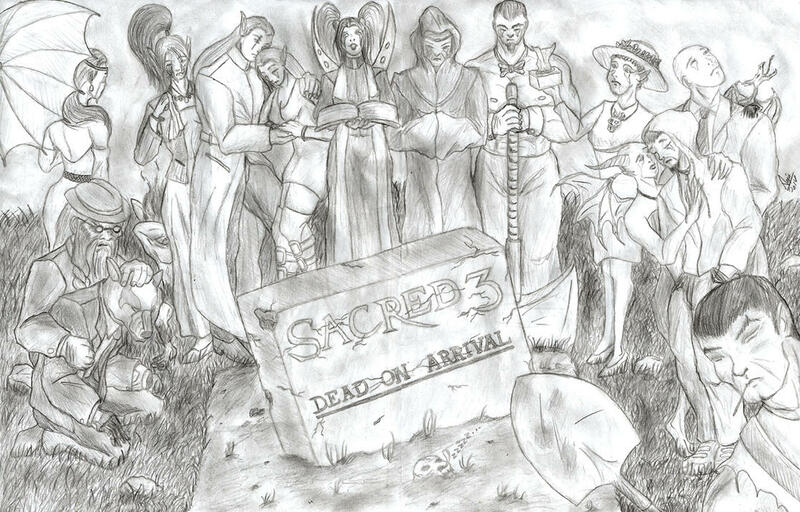 Has this been posted on the official Sacred 3 forum yet? Though there should be no harm in posting it again. Does anyone have an account there?